Would you spend AED28,000 on a pair of sunglasses or other fashion eyewear? You might if you drove a Bentley and appreciated the finer things in life, and according to the luxury brand, you are in good company in the Middle East. 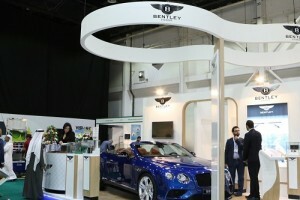 Launched at the Vision-X exhibition in Dubai this week, the new Bentley Eyewear collection is expected to be as popular as the luxury cars carrying the same legendary name, which persuade people to part with more than AED1Million. That’s the price to pay for a Bentley GT3 Continental V8 Sport 2016, which has been parked alongside the bespoke eyewear collections unveiled at the Dubai World Trade Centre exhibition halls this week, raising more than a few eyebrows. Like the car, Bentley eyewear is different. The Gold Collection frames made entirely of 18 karat solid gold, and have a lifetime guarantee. There are plenty of takers in the UAE and around the region. 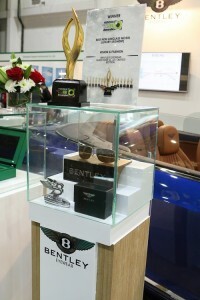 As Vision-X visitors have been seeing over the last three days the eyewear collections, like Bentley cars, appeal to VVIPS because they are different, and focus on quality. They also share the same model names, like Mulsanne, GTC, Continental and V8. Every detail, including nose bridge, nose pad, temples, lens colour, and ear piece, can be customised. If you really want something special, your handmade Bentley sunglasses can be wrapped in the same leather as your Bentley car seats. If the price tag is too much for you, there’s always The Regular collection which retail at AED5,000, and will soon be in Vision and Fashion stores in the UAE, Saudi Arabia and Egypt. Middle East consumer demand for luxury has been evident from the wide range of high end products launched at Vision-X,the Middle East’s largest optical trade show, which concludes tonight (Wednesday). Saudi Arabia-based Amico Group, which represents The Kering Group in the region,showcased eyewear brands including Stella McCartney, Alexander McQueen, Boucheron, Pomellato, and Saint Laurent. “The market in Dubai is very fashion orientated and you will find that most outlets will sell all the big brands,” said Ahmad Hamou, Sales Manager – Optical Division, Amico. Running alongside the three-day exhibition, the Vision-X Opticare Conference, accredited by the Dubai Health Authority, saw a host of high level speakers discussing the latest healthcare topics such as myopia, low vision, paediatrics and optical business management. Vision-X returns to the Dubai World Trade Centre in October 2016. Caption: Eye catching – Bentley steals the show at Vision-X.